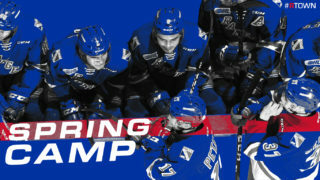 A total of six Kitchener Rangers players and prospects have been invited to Hockey Canada’s National Teams’ Summer Showcase. Adam Mascherin was one of 42 players invited to tryout for Team Canada’s U-20 World Junior squad in Plymouth, Michigan in December. Giovanni Vallati and Riley Damiani, along with prospect Merrick Rippon, were each selected for Canada’s National Summer U-18 Selection Camp in Calgary, Alberta in July. Players chosen to don the red and white will represent Canada at the 2017 Ivan Hlinka Memorial Cup later this year. Also in July, more than 100 players will take part in Canada’s National Summer Men’s U-17 Selection Camp in Calgary. 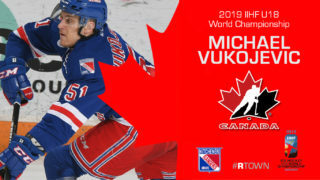 Of those invited were Rangers’ first round selection Grayson Ladd, and second round selection Michael Vukojevic. A full list of the OHL’s invitees for each group is listed below, as well as links to more information on each selection camp. 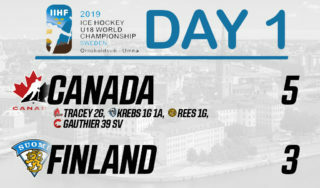 The evaluation process will continue when the players return to their home clubs, with an eye to fielding the best in Canadian talent at the 2017 World Under-17 Hockey Challenge in Dawson Creek and Fort St. John, B.C., the 2018 IIHF World Junior Championship in Buffalo, N.Y. in December, and the 2018 IIHF U18 World Championship next spring.